You see it right! 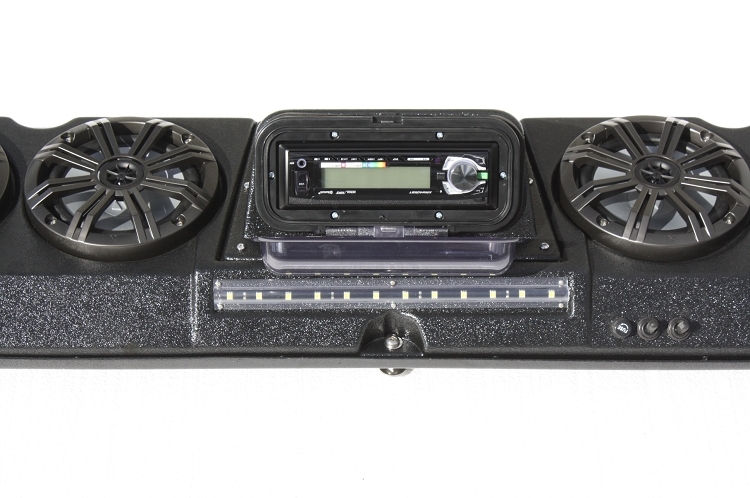 Yes 4 big 6.5" KICKER speakers in one slender unit that neatly fits just aft of the windshield on all new Polaris Ranger UTV's with Full Size or Crew Size cabs. You get the ultimate "loud" sound quality in one package for one low price! And, It's Made In The USA! Quality molded in durable ABS, same as under the hood of your car and much of your Ranger. Stylish design, not a box like others make. Designed with fit and finish to look as if it came from the factory. PLEASE NOTE: We must know what model and year make of your Ranger. We make (2) mounting kits, one for the "Tube Style" cages, and another for the "Hydro-Formed" cages. All you need to do is leave this in the message box, or give us a call during business hours. If you are not sure please call us and we will help determine what type cage your machine has.